This article is about the world. For the castle, see Hollow Bastion. Radiant Garden, also known as The Radiant Garden, is an explorable world in Kingdom Hearts II and Kingdom Hearts Birth by Sleep. It is also featured in Kingdom Hearts 3D: Dream Drop Distance and Kingdom Hearts III, although only in cutscenes. Radiant Garden is the home world of many Final Fantasy characters within the series, as well as the original home world of Kairi, Ansem the Wise, and many of the members of Organization XIII's human forms. 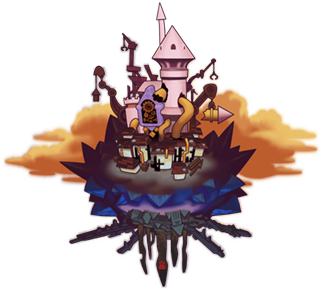 A ruined incarnation of this world appears in Kingdom Hearts, Kingdom Hearts Chain of Memories, and Kingdom Hearts coded, under the name "Hollow Bastion", consisting primarily of the castle that lies in the center of the world, with the areas outside mostly destroyed. Even after its restoration, it continues to go by this name until the events of Kingdom Hearts II. After the world was reduced to just the castle, following an assault by the Heartless, it is called simply "Hollow Bastion". It regains its name in Kingdom Hearts II after Tron finds a record of its former glory in the computer's database and shows everyone how the town used to look, causing everyone from the Radiant Garden to remember its name. This world is run by Ansem the Wise and the Hollow Bastion Restoration Committee in Kingdom Hearts II. As the ruined Hollow Bastion, the world is controlled by Maleficent. In Kingdom Hearts II, the Radiant Garden plays a similar role to Traverse Town from Kingdom Hearts, as a sort of "home base" for Sora before his return to the Destiny Islands. The Central Square (中央広場, Chūō Hiroba?) is a square located in the middle of the world. Going northwest will take the protagonist to the Gardens (庭園, Teien?). Going east, the protagonist will find a flight of stairs leading to the Front Doors (正面扉口, Shōmen Tobira Kuchi?). Another flight of stairs going up will take the protagonist to Hollow Bastion. Back from the square, going east takes the protagonist to the Castle Town (住宅街, Jūtakugai?, lit. "Residential Area"). From here, the protagonist can access Merlin's House (マーリンの家, Mārin no Ie?). Once the protagonist leaves the Castle Town, there is a path that will lead them to the Fountain Court (噴水広場, Funsui Hiroba?, lit. "Fountain Square"). The upper section (not the middle) of this place is the Aqueduct (水路, Suiro? ), Radiant Garden's irrigation system. Past this place is the world's Reactor (動力炉, Dōryoku-ro?, lit. "Power Reactor"). The Central Square has another door, past two flights of stairs, one on either side, which will take the protagonist to the Entryway (エントランス, Entoransu?, lit. "Entrance"). Past that are the Outer Gardens (城外庭園, Jōgai Teien?, lit. "Outer Castle Gardens"). There is a secret door in the middle of this place, which leads to the Purification Facility (浄化施設, Jōka Shisetsu? ), which is situated below the gardens. Sora first arrives in the Radiant Garden (still known as Hollow Bastion at the time) at the Marketplace (商店街, Shōten Machi?, lit. 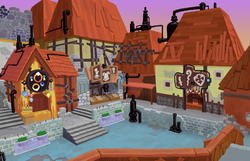 "Shopping District") which houses the world's Moogle shop, as well as Scrooge McDuck and the accessory, weapon, and items shops of his nephews Huey, Dewey, and Louie. Down the stairs past the item shop is the Borough (住宅街, Jūtakugai?, lit. "Residential Area"), a residential area where Merlin's House (マーリンの家, Mārin no Ie?) is located. It's also the Hollow Bastion Restoration Committee's base of operations and leads to the world 100 Acre Wood. Continuing on, leads the Bailey (城壁広場, Jōheki Hiroba?, lit. "Castle Walls Square") which allows a look of Villain's Vale and access to the Restoration Site (建設中通路, Kensetsu-chū Tsūro?). After the events of the first journey to Space Paranoids, the layout of the Bailey is altered; the outer wall of the city has broken down, and the Castle Gate (城門前, Jōmon Mae?, lit. "Gate Before the Castle") can be accessed through the Bailey. The Restoration Site contains the equipment used to restore the city. It is also changed after the first visit to Space Paranoids, which allows access to two new treasures. At the end of the Restoration Site is the entrance to the castle, Hollow Bastion. If the protagonist goes to the Castle Gate from the Bailey, there is an old gate similar to the one in Kingdom Hearts. From the Castle Gate, the protagonist will reach the long and winding Ravine Trail (谷間の道, Tanima no Michi?) that eventually leads to the Crystal Fissure (結晶の狭間, Kesshō no Hazama?, lit. "Crystal Interstice"), a small cave-like area with glowing crystals. This leads to The Great Maw (大渓谷, Dai Keikoku?, lit. "Great Valley"), a large area where the Battle of the 1000 Heartless is fought. 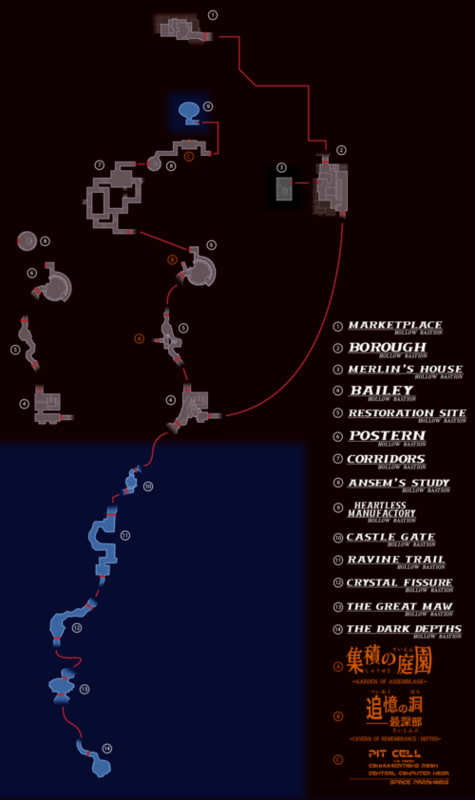 The next and last area is the Dark Depths (闇の淵, Yami no Fuchi? ), where Sora and his friends encounter Xemnas, Saïx, Axel, and Maleficent. The Bailey has a good view of the Villain's Vale (ヴィラン砦, Viran Toride?, lit. 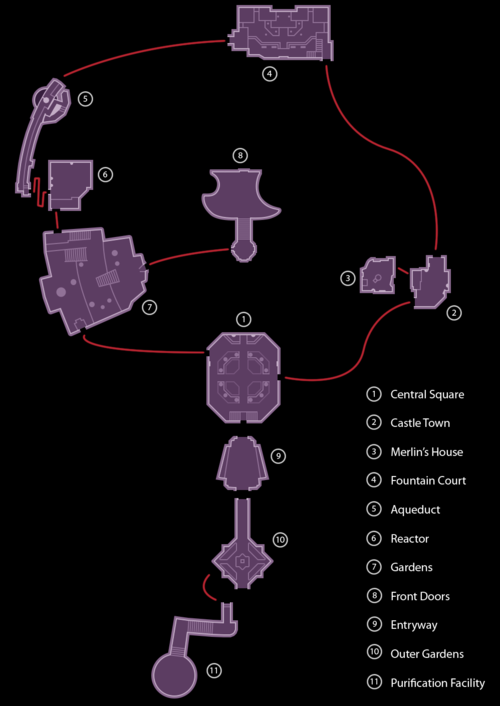 "Villain's Fort") which is an unreachable area in Kingdom Hearts II. Villain's Vale contains a room inside, also known as Villain's Vale (ヴィラン砦の一室, Viran Toride no Isshitsu?, lit. "Chamber of the Villain's Fort"), which acts as a base of operations for Maleficent and her forces of darkness. After discovering that Maleficent had been defeated, Pete showed up here to see if it was true. He found an empty fortress, but was soon greeted by a resurrected Maleficent. When Sora and co. first arrive in Hollow Bastion, at the base of the Vale is a swarm of Shadow Heartless. Leon and the rest of the Hollow Bastion Restoration Committee wish to restore the city, but first need to get rid of the Heartless. After the Battle of the 1000 Heartless, the base of the Vale is no longer surrounded by Heartless. The Heartless were amassed together by Maleficent and Pete for their army and then used to attack Hollow Bastion. The Heartless, however, sided with Organization XIII and did not finish attacking the city. Villain's Vale appears in several flashbacks seen in Timeless River. As Maleficent treats Pete badly after his failure, the latter begins wishing he could return to the old days when he captained the Steamboat Willie. In response, the worlds gave Pete a doorway to his past to atone for his mistakes. He shows the door to Maleficent, who orders him to go to the past and destroy the Cornerstone of Light so that they may take control of Disney Castle in the present. After losing Hollow Bastion to the Hollow Bastion Restoration Committee, she deems the crumbling fortress unworthy, and begins searching for a new, grander castle in which to rule, setting her sights on both Disney Castle and the Castle That Never Was. Radiant Garden, once known as the "city of light", was a beautiful city of gardens and fountains that lay below Hollow Bastion, a glorious castle kept by a loving king, Ansem the Wise, and his apprentices. Much of the history of the castle is unknown, other than that Ansem ruled from it. The three Keyblade wielders, Terra, Ventus, and Aqua, all arrive in the town at roughly the same time. Ven, meanwhile appeared in Radiant Garden after Mickey's Star Fragment sent him there, however, he sees Mickey walking towards the castle and follows him to the front doors, but the guards, Dilan and Aeleus prevent his entrance. A giant Unversed appears, causing Ven to chase after it. The guards prepare to follow, but are reprimanded by Even, who says that the boy can take care of himself and also senses that Ven has no darkness in his heart, or rather it was taken out. In the town square, Ven defends Scrooge McDuck from the Unversed so the mister offers him three lifetime passports to Disney Town. Ven thanks him and runs after the Unversed, meeting Merlin along the way. All three heroes arrive at the same place by chasing their respective Unversed. They are surprised to see each other, but first defeat the Trinity Armor that forms. They fight together and win. Ven shares his tickets to Disney Town with his friends. Ven tells of his journey and how he even defeated a masked boy who bad mouthed Terra. Terra knows this is Vanitas and bids him to go home with Aqua. Aqua wonders if Terra has gotten too close to the darkness. Terra is insulted and feels that Eraqus sent her to spy on him. As Terra leaves to follow his own path, Ven displays disbelief to Aqua's claims and goes after Terra, but not before telling a disheartened Aqua that she has changed. Terra enters the lower portions of the castle where he meets Braig, who openly tells him that he has captured Master Xehanort. Terra goes further into the castle to find the last person he trusts, but is approached again by Braig who wants the Keyblade for himself. The two battle, with the captured Xehanort imploring Terra to give into his darkness. Terra eventually does so, and shoots a Dark Firaga at Braig's face, giving him the scars he appears with later and blinding one of his eyes. Terra and Xehanort form a pact to work together to destroy Vanitas. Terra then prepares to leave, even after Ven wants to come with him. Aqua, meanwhile, left towards the town square, meeting Merlin on the way. In the town square, she meets Vanitas, who taunts her by inquiring about Ventus and then attacks. Aqua wins the battle, but Vanitas escapes, complementing her on her skill, and making an ambiguous comment that she'll be his "Plan B" and finishes by telling her only to get stronger. Ven then arrives, wanting to go with her as well, but Aqua declines and tells him just to go home, she then leaves. In the last chapter, Aqua comes to Radiant Garden looking for Terra after creating Castle Oblivion. She finds Terra, however possessed by Master Xehanort's dark heart. Aqua struggles when he tries to strangle her, but she tries to make him remember his true self. Terra cannot overpower Xehanort's heart, leaving Aqua no choice but to battle her friend. Terra awakens the darkness in his heart in the form of Xehanort's guardian. However Aqua proves victorious, and Terra tries to release the darkness in his heart by sending himself to the Realm of Darkness. Aqua jumps in after him wearing her armor as protection. Unfortunately, Aqua realizes cannot save both of them, so she gives Terra her armor and Keyblade to protect him, and sends him back to the Realm of Light, while she stays in the darkness. A year after the battle at the Keyblade Graveyard, Xehanort and the other apprentices overthrow Ansem, and remodel the castle to include mechanical components. The result is a twisted bastion; half beautiful castle, half distorted factory. Maleficent invades Hollow Bastion's world with her Heartless shortly afterwards. Some residents manage to escape, many of whom end up in Traverse Town. However, Kairi is sent into the "oceans of the worlds" by Xehanort and ends up in Destiny Islands, partly due to the spell Aqua put on her necklace. 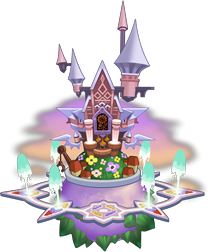 During her reign in the castle as one of Ansem, Seeker of Darkness's unwilling minions, it is probable that Maleficent either creates or remodels the castle's keep, which has decorations and models of roses and her thorned plants. Following their adventure in Castle Oblivion, Riku and Mickey Mouse walk through the Great Maw of Radiant Garden. Riku briefly stops and kneels down, prompting concern from Mickey, but Riku quickly stands up and they continue walking. The party returns briefly to visit and assist Merlin, who has found Pooh's book, the entrance to the 100 Acre Wood. However, a raid by Heartless damages the book when they try to steal it from Sora's group, leading to Pooh's amnesia and the search for the book's Torn Pages. Optionally, Sora and co. find and fight Sephiroth at Villain's Vale after Radiant Garden's chaotic situation is solved. If he is proven victorious, Sephiroth tells him to find Cloud so that they may finish everything once and for all. Cloud and Sephiroth emit in a great battle until Tifa arrives and renews his light, giving him the strength to fight Sephiroth. Cloud and Sephiroth disappear to once again finish their battle. Tifa gives Sora the Fenrir Keychain as token for her gratitude for helping her and Cloud. Following the demise of Organization XIII, Lea wakes up in the computer room and notices that he has reverted to his original human form. He ventures into Ansem's study, where he finds Dilan, Even, Aeleus, and a now-adult Ienzo. They also take note that Braig and Isa are mysteriously missing, prompting Lea to decide to go and search for them. After Sora and Riku's Mark of Mastery exam, Lea returns to Radiant Garden. Radiant Garden has been completely rebuilt. Pre-release screenshots and trailers for Kingdom Hearts Birth by Sleep showed Terra conversing with and carrying Ven in The Great Maw from Kingdom Hearts II. However, this area wasn't included in the game at all, and the scene was moved to the Land of Departure.